At the center of the ancient world and the pulsing heart of modern Italy, Rome will surprise and captivate you! One bedroom penthouse apartment with rooftop terrace near the Spanish Steps. Comfortable apartment in the heart of Ancient Rome! 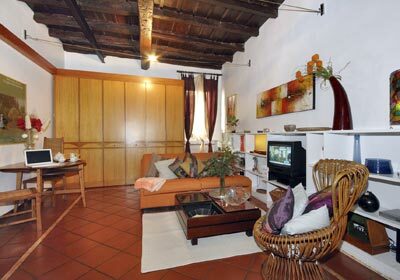 Cozy one bedroom apartment in Trastevere, the Romans' Rome! Newly furnished 2 bedroom, 2 bath apartment near the Spanish Steps. Cute one bedroom apartment with terrace. Charming, recently remodeled, 2-bedroom, 2 bath apartment with gorgeous garden terrace. Lovely, large two bedroom, two bath apartment near the Vatican. Recently renovated two-bedroom, one-bath apartment near the Piazza Navona. A lovely 2-bedroom, 2-bathroom apartment on a beautiful street just off of Piazza Navona. 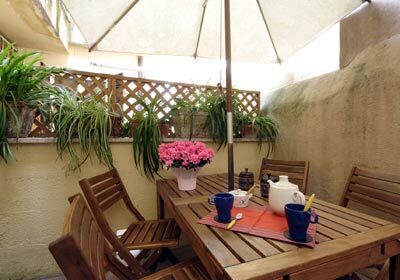 A lovely two-bedroom apartment in one of Rome's most charming old neighborhoods. Transfer by private driver from the Rome airport (or rail station) to your new Untours home, and transport back to the airport or rail station on your departure. A transit pass good for unlimited rides on Rome’s extensive system of buses, trams, and metro. An orientation with our on-site staff. This will cover using the public transit system and practical advice for sightseeing, tours, and reservations. Local maps and literature, plus our own Untouring Rome guidebook, researched and written by Untours staff, full of the best restaurants, sights, and other suggestions. A local cultural activity, such as a tour of a historical site like the Castel Sant'Angelo. A stash of groceries upon your arrival, so you don’t need to dash off to shop right away.